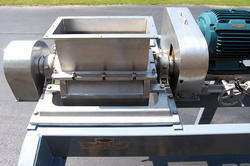 The Mantis belt-fed slicer is similar in design to the Urschel Translicer 2510. It is a single dimension (slicer) or two-dimensional (dicer) manufacturer recommended for flat and crinkle cutting a wide range of fruit and vegetable products, meats, and even baked goods. V-trough belt infeed conveyor, 4 inches wide by 93 inches long. Comes with 12-blade flat slice head. Other cutting wheels / head and belt speed setups are available: CALL ALARD at 315-589-4511 to discuss your cutting specifications! 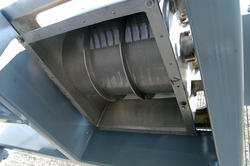 Variable speed controls for feed belt and cutting wheel also determine slice thicknesses. Various cut sizes possible (with suitable cutting wheels / change parts) from 1/32 inch (.8mm) to 2.36 inch (60mm). Will accept solid products up to 4.4 inches (160mm) in diameter or leafy products up to 6.29 inches in diameter. Throughput up to 8000 kg/hr (17,637 lbs) depending on product and cut. Ideal for coin-cutting or crinkle disk cuts for products like pickles / cucumbers, pepperoni, carrots, zucchini, or segment cutting / chopping romaine lettuce, carrots (for baby carrots), celery sticks, eggplant, or many other products. 5HP 460 volt 3 phase electrical input. As of this writing, this Fam Mantis cutting machine is in stock at Alard, in very good operational condition, available for immediate shipment. 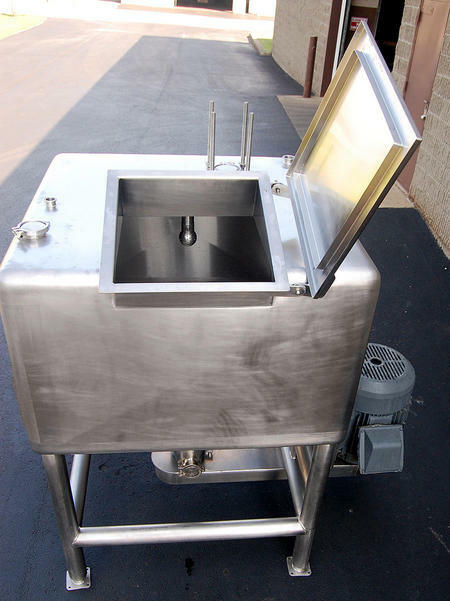 3 foot square tapered stainless steel infeed hopper with pouring grid. 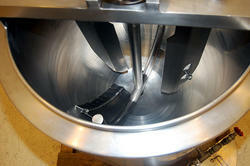 20 inch wide by 8 3/8" long "throat" opening from the hopper to the reversible stainless steel cutting chamber. Comes with 2 sided stainlesss steel hammers, sharp on one side, blunt on the other. Other hammer / knife parts for this comminuting machine are readily available; CALL 315-589-4511 to discuss your specific cutting / grinding milling application. Stainless steel screen cage beneath hammers / knives determines cut cut size / particle size output; --CALL 315-589-4511 to discuss your particular particle size reduction requirement. 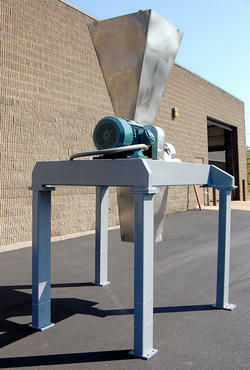 Stainless steel discharge chute 3 feet deep, with a 16 inch by 14 inch bottom discharge opening. Food grade, all stainless steel product contact surfaces. 5 foot high painted steel legs. 208/230/460 volt 3 phase 25 HP drive. As of this writing, this Fitzpatrick mill is in stock at Alard, in EXCELLENT operational mechanical and cosmetic condition, and available for immediate shipment. CALL 315-589-4511 to confirm availability, and to discuss your particular food product particle size reduction needs. Search head ONLY, suitable for mounting on a conveyor for belt-transfer, on a frame with an anti-static trough for slide-thru use, or with an anti-static plastic tube chute for drop-thru use. (No conveyor, trough or chute is included unless othewise stated). 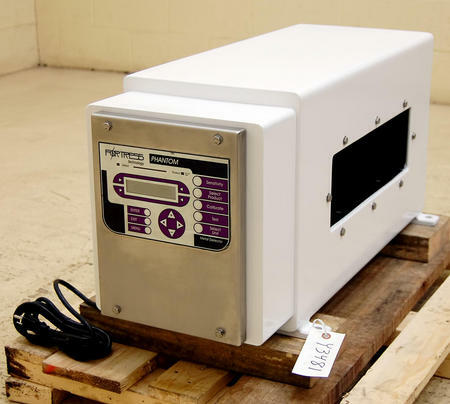 As of this writing, this food grade METAL DETECTOR is in stock at Alard, in EXCELLENT operational, electrical, mechanical, and cosmetic condition, available for immediate shipment. CALL 315-589-4511 to confirm availability, and to discuss your particular industrial process metal detection needs. ...A Walker 300 gallon capacity Likwifier for high-shear agitation agitation to disolve, emulsify, disperse solids and semi-solid ingredients in liquids, including powders, natural gums, thickening agents, flours, cocoas, yeast, powdered eggs, starches, condiments, caseinates, juice concentrates, food purees, whey solids, and even cheese slurries. 48 inch by 48 inch by 30 inch deep single wall square body blender vessel with 2.5 inch bottom side outlet with Tri-Clamp connection. 19 inch by 20 inch top hinged manway cover. USDA food grade sanitary all stainless steel construction. CIP ball in mixing vessel. NEW impeller and drive-train including bearings, bearing housing, belts, pullies. 20 HP 3 phase belt drive motor, available to be cleaned and serviced as currently wired to 575 volt (Canadian voltage), or can be rewound to US or other voltage per buyer specification. 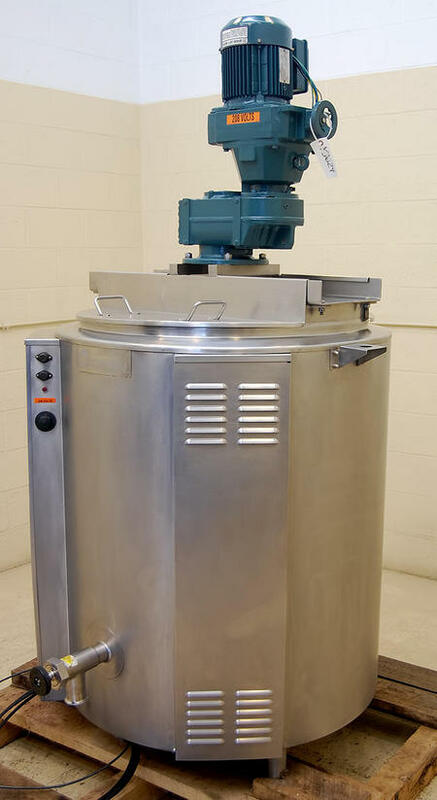 Aside from preparing the motor to buyer specification, as of this writing, this high-shear liquid emulsifier mixer is in stock at Alard, in EXCELLENT operational, mechanical, and cosmetic condition, available for timely shipment. CALL ALARD at 315-589-4511 for current availability, and to dicuss your food equipment needs. 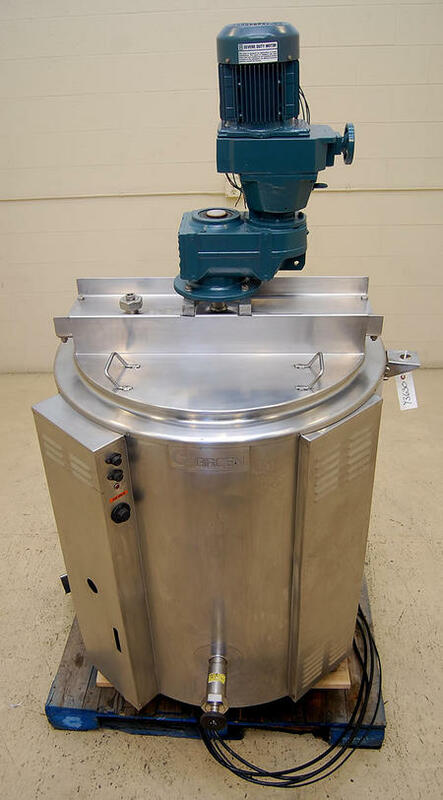 A Groen model EE-100 cooker / mixer, self contained with electric heat, manufacturer recommended for a wide variety of applications, including soups, stews, sauces, pudding, pie fillings, powdered mixes, and other foods that require mixing during the cooking process. 32 inch diameter by 36 inch deep hemispherical bottom stainless steel cooking kettle, with 2 inch side bottom outlet with Triclamp connection, and plunger valve included. Stainless steel single motion scrape surface agitator, with variable speed 1.5 horsepower mixer drive, on a stainless steel bridge. Integral electrially powered heating system, does not require an external boiler. Steam jacket manufacturer tagged, national board coded and U-stamped for 30psi at 300 degrees Fahrenheit. (2) removble stainless steel covers. All food grade sanitary stainless steel steel construction. 208 / 230 volt 3 phase 90 amp electrical input. 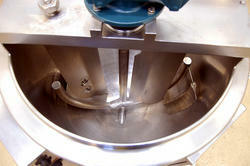 CALL 315-589-4511 to confirm availability, and to discuss your particular food process cooker / mixer need(s). 5.75 inch high by 19.75 inch wide net USABLE aperture opening with the conveyor belt in place. NEW stainless steel belt transfer through-conveyor, with a 72 inch long by 16.25 inch wide interlocking plastic chain type belt running over an anti-static UHMW plastic bed. Epoxy painted aluminum search head enclosure, with new water-tight epoxy chute / liner. Integrated belt-stop alarm reject system with new gasketed PVC control box. Other reject configurations available as options. 34 inch working height on threaded rod adjustable feet. 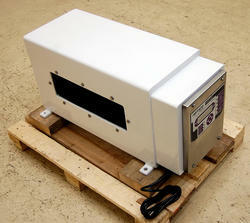 New fractional horsepower conveyor belt drive with variable speed controller. All food grade stainless steel and aluminum construction metal detection system. As of this writing, this reconditioned metal detector on a NEW conveyor is in stock at Alard LIKE NEW, and in EXCELLENT operational, electrical, mechanical and cosmetic condition, available for immediate shipment. CALL 315-589-4511 to confirm availability, and to discuss your particular metal detection equipment needs. VIDEO DEMO of Urschel model OC crosscut bias SLICER cutting sausage slices. Urschel OC crosscut bias SLICER cutting sausages Y2563 from Alard Equipment Corporation on Vimeo. An Urschel OC TRANSVERSE SLICER for making angled coin cuts of oblong fruits and vegetables in a variety of crinkle or flat bias slices. Adjustable spring-loaded mechanical product hold-down mechanism, keeps products straight and level as they pass through the cutting head. Flat slices or crinkle cut cutting setups are available. CALL ALARD at 315-589-4511 for current availability, and to discuss your particular cutting specifications. Manufacturer recommended for pickles, carrots, celery, plantains, rhubarb, okra, potatoes, zucchini, squash, bread, and a variety of other vegetable and fruit products. 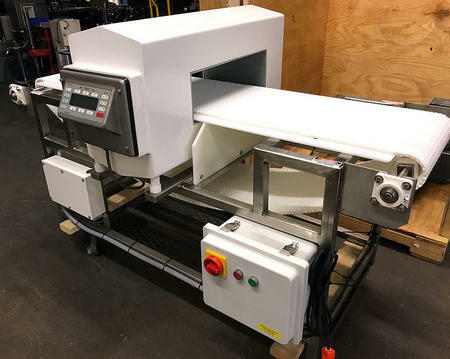 As of this writing, this LIKE NEW Urschel OC slicer is in stock at Alard, in EXCELLENT operational, mechanical, electrical and cosmetic condition, available for immediate shipment. CALL 315-589-4511 to confirm availability, and to discuss your particular fruit and / or vegetable slicer need(s). Key Iso-Flo vibrating shaker - grader Y3649 from Alard Equipment Corporation on Vimeo. 45 inch wide by 8 foot 10 inches inch long shaker bed, with 7.5 inch high stainless steel sides. 46 inch long by 48 inch wide flat solid surface infeed section. (2) 24 inch long removable rod screen panels, with 3/16 inch rods on 1/4 inch centers. Quick-release hooks for fast, tool-less screen replacement. 10 inch long flat solid surface discharge section, tapers to 46 inch wide at discharge. 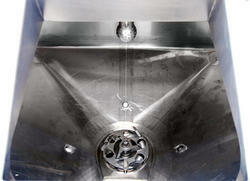 Stainless steel catch pan for solids or liquids, with 12 inch square discharge opening. 66 inch infeed height, 57 inch discharge height, on stainless steel pedestal legs. Key Iso-Flo eccentric drive, with 3 phase motor.